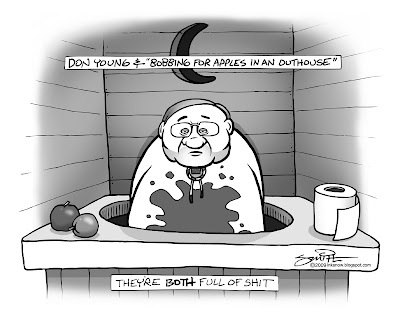 Ink & Snow: "Bobbing for Apples in an Outhouse"
"Bobbing for Apples in an Outhouse"
I've been installing insulation in a cabin the past couple days, and it's an awful lot like politics: gets under your skin and drives you crazy. That and makes you die a slow, horrible, cancerous death. Sarah Palin's congressional political counterpart, Minnesota's Michele Bachmann, led a Republican patriot-tea-bagger protest against health care outside the US Capitol, and our own Congressman Don Young attended the rally. Given Don Young's penchant for embracing right wing craziness one can only assume he tacitly approved of the rhetoric of thousands of people screaming "Kill" and carrying signs that read "Waterboard Congress" and Holocaust images from the Dachau crematoria comparing health care legislation with Nazi Germany. In fact, an official press release from his office makes a statement equating the health care bill to "bobbing for apples in an outhouse." Or, as succinctly phrased over on Mudflats; it's "Time for Republicans to Start Eating Their Young."